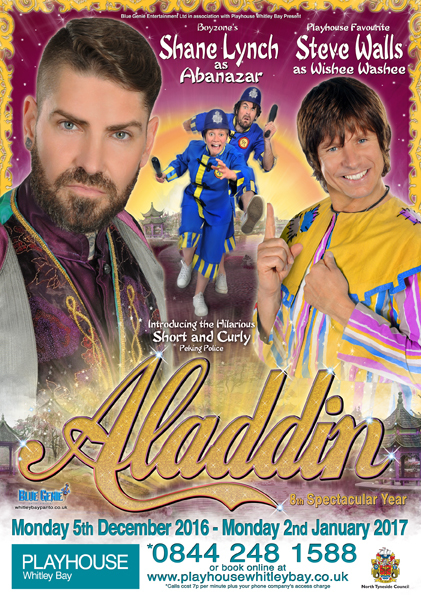 I couldn't contain my excitement when I heard that none other than Shane Lynch was starring in Aladdin as Abanazer this year. I was a HUGE Boyzone fan back in the day and after thoroughly enjoying Fay Tozer's (of Steps fame) performance with the company last year, I knew we'd be in for a treat. 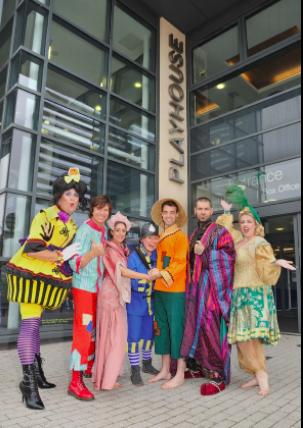 The Playhouse is quite a modern theatre which means you'll benefit from ample leg room compared to older theatres and you won't feel as cramped. There's also a free car park if you're able to get a space. 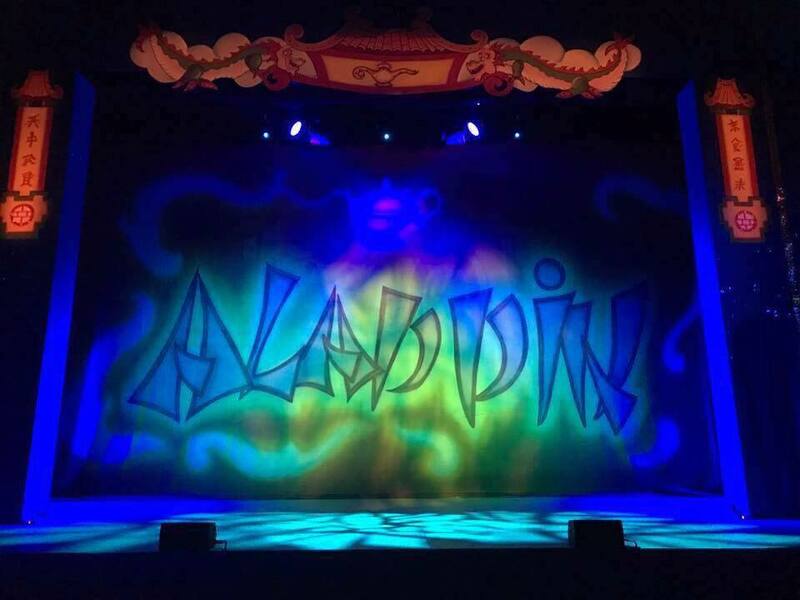 Tickets to this year's Aladdin are very reasonably priced, with family tickets available for most shows and seats at just £14 per person. Unfortunately Grant Flanagan who had been cast to play Widow Twankie had to pull out of the production at the last minute. Luckily, Paul Harris was able to step into his place with only 6 days left to rehearse. Paul is an established and experienced performer and stepped up to the mark, however I am pretty sure he must have been cut from a couple of scenes as the dame didn't have as big of a starring comedy role as you would normally expect. I'm sure this may change as the production continues and audiences will hopefully get to see more of Widow Twankey as Paul becomes more established in his role. Even without a huge dame presence, there are still plenty of jokes with Playhouse favourite Steve Walls delivering lots of one liners as Wishee Washee and easily getting the kids on side. Some of the jokes are just about on the right side of clean but will certainly receive a few raised eyebrows from the grown ups. PC Left and PC Right made me smile with their funny ways and comedy OTT acting - watch out for those ice cream pies and of course Aladdin wouldn't be Aladdin without some poor soul having to go through the laundry. The music for me was a little bit too generic this year - as mentioned above, Fay Tozer was spectacular last year and her voice was just superb and there was a just as memorable performance of 'Stay with me' by the Beast in Beauty and the Beast the year before that. Sadly there is no such stand out song this year but you will be nodding along to pop favourites like 'Bills' and there's even a bit of Rick Astley thrown in for the mums. I expected Shane Lynch to have a few numbers but unfortunately, he doesn't take on a singing role. 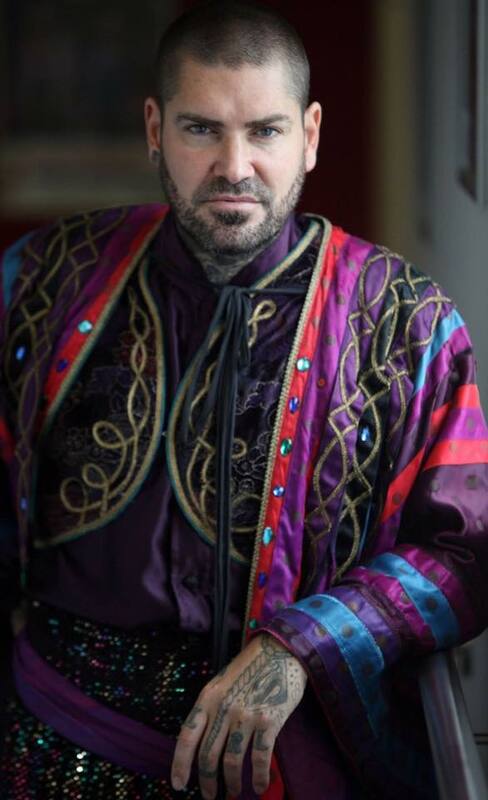 In fact, it really saddens me to say this but I don't think Shane Lynch was all that great to be honest. He didn't manage to build a rapport with the audience and didn't make a convincing bad guy. It felt more as if he was just a token celebrity brought in to sell tickets which is disappointing as normally, Blue Genie get it spot on with their casting. Enough of the doom and gloom though - there were parts of Aladdin that we loved. The flying carpet scene had my kids believing the magic was real and Jack's eyes were like saucers. If you've watched a panto at the Playhouse before, you'll know what to expect when ghostbusters starts to play. This year's scene exceeds last years and the kids will be jumping up and down on their seats and screaming at the stage. They love it. There are some fantastic performances from the two genies and we particularly warmed to Georgia Nicholson as 'The Geordie of the Lamp'. She kind of reminded us of Sarah Millican and was instantly likeable by young and old - definitely the star of the show for us. I would love to see more of Georgia and hope she returns next year. The show ends with a mini Boyzone medly and Wishee Washee tried to get the crowd up on their feet but there weren't many takers. Personally, I don't think this was the best way to end the show (unless perhaps it is a Saturday night and the mams in the audience have had a few). Panto is for kids and most won't have a clue what these songs are. Considering Shane Lynch didn't really take on a starring role in these songs, I think they should just skip this finale and stick with something Christmassy that the whole audience will know and can sing along to. So........you might have gathered that this wasn't the best panto we've been to this year, however if you are local, I definitely wouldn't discount it - with tickets at around £14 per person it is only a couple of pound more than a trip to the cinema but way more fun and I think the classic Ghostbuster routine alone is worth the ticket price. I was unfortunate to be sitting amongst babies and toddlers who spent a lot of the time crying as well as some rather rude adults who decided to talk through most of the performance. I'm not sure if this tarnished my experience a little as I wasn't able to give the production my full attention due to these distractions. I say this because as we were leaving, I always listen to what others are saying about the show and most seemed to be saying that they thoroughly enjoyed it so my annoyances could just be down to bad luck and where I was sitting. 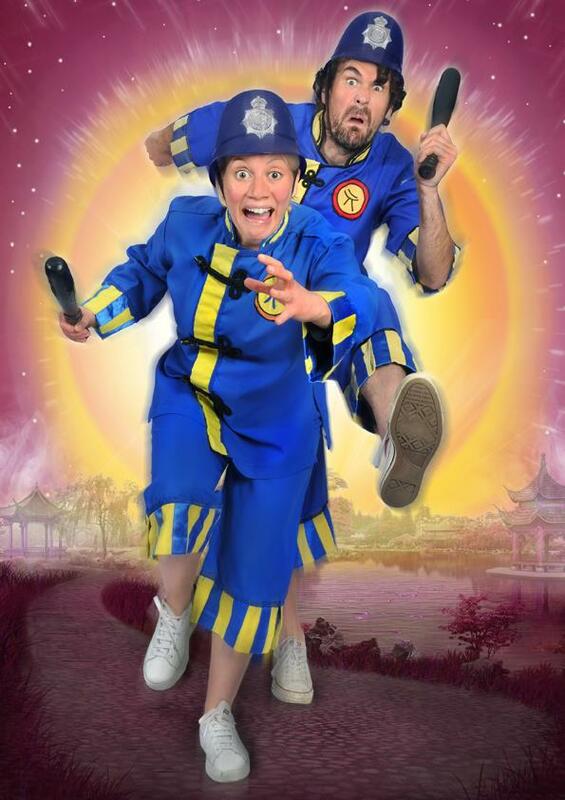 Aladdin continues at Whitley Bay Playhouse until 2nd January 2017. Blue Genie will return next year with Cinderella. Let me know if you've been to see the show and what you thought of this year's production. HATE HATE HATE people talking through live performances, it is beyond rude and such a bad example to set to your kids as well - how will they learn to respect people if their parents can't behave?!! Not surprised Sean wasn't very good, he was never v good in boyzone really! HA!!! OMG I just called Shane Sean?!! My 16 year old self is very angry! Oh no! I am so excited to see Shane! I fear you are probably right though coz he was never the best singer! I thought the show was the very epitome of "family fun". Kids were shouting enthusiastically at the right times, I had plenty of laughs. I thought Shane did a canny job as a buddy...although he was a bit too likeable! Great time had by all of us.